Speeding up optical networks; multiband solar cells. 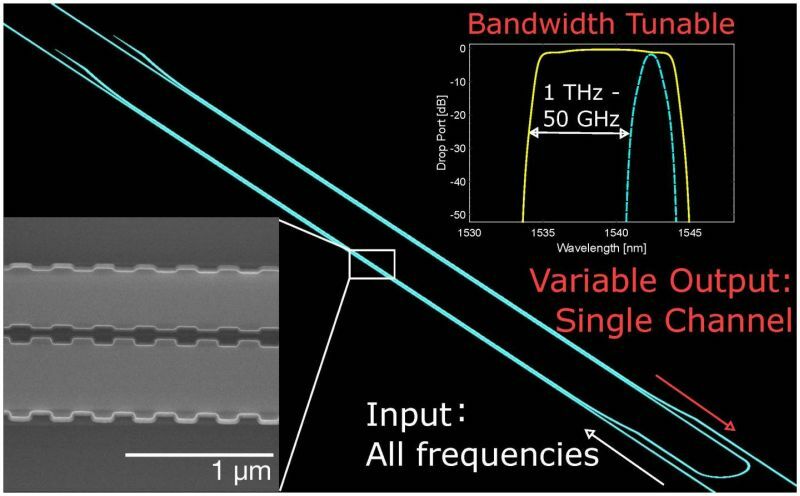 A tunable filter for high-capacity optical networks that can be integrated onto a photonic chip has been designed by researchers at the Université Laval in Québec, Canada. The device’s performance is comparable to the best bench-top systems, according to the reasearchers, but at a fraction of the size and cost. The filter’s tuning span, which is a measure of how well the device can adjust to fluctuating data demands, is the widest ever demonstrated on a silicon chip. Additionally, the device has an unlimited free-spectral range, meaning it can operate over any range of frequencies, and shows excellent performance metrics in other standard measures of filter quality, including very low insertion loss and in-band ripples, low crosstalk and small delay variation. The tunable filter has a tuning span of 670 GHz, much greater than the approximately 100 GHz span other silicon-based filters have achieved. The researchers believe that with further modification their device’s tuning span can be even further extended, to 1 THz. The device works by using periodic nanostructures, 10,000 times smaller than the width of a human hair, to separate the different frequencies of light from each other. The filter tuning is achieved with micro-heaters in the silicon chip that control the local temperature, which in turns affects the nanostructures and the frequencies they separate. The wide tuning span means the filter can handle a very large data volume carried by a single carrier, and can be rapidly adapted to dynamic changes in customer needs. The device also has a compact footprint and is built on a CMOS-compatible nanophotonic integrated platform. Going forward, the researchers plan to integrate the tunable filter with other components on the same chip to test chip-scale flexible optical networking. One problem with modern solar power is that while the solar spectrum covers a wide range of energies, solar cells can only harness light of a single energy, so very little of the available energy is actually captured. A potential solution is an intermediate band solar cell, comprising an intermediate band built into a wide-gap semiconductor. But in order for the cell to work, incident photons must be able to transfer charge using all three band transitions (valence-intermediate; intermediate-conducting; and conducting-valence), in a process known as optical absorption. That’s the difficult part. Now, Berkeley Lab researchers have engineered an alloy solar cell and demonstrated that optical transitions do indeed occur in all three cases. Instead of looking for absorption of photons, the team decided to experiment with photon generation. A semiconductor can be used in two ways: as in a solar cell, an absorber to produce electricity; or as in an LED where application of external voltage produces light. 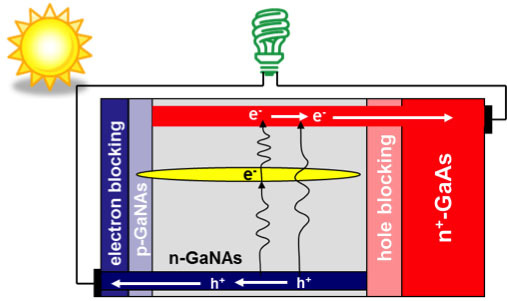 The Berkeley team showed that application of a voltage to their previously developed intermediate band solar cell structures leads to emission of photons. They simultaneously observed two electroluminescence peaks corresponding to the optical transition energies expected in the cell structure. The key to success was the team’s previous discovery of alloys that allowed them to engineer semiconductor band gaps. They showed that incorporating nitrogen into semiconductor gallium arsenide results in the formation of GaNAs alloy that has a third intermediate band. For this study, structural variations with a blocked intermediate band confirmed that electroluminescent peaks originated from transitions between the intermediate and the conduction and valence bands. According to Berkeley, not only did the experiment show the optical transitions which are key for an intermediate band solar cell to perform, it also opened a potential for using modified cell structure as a multicolor light emitter.